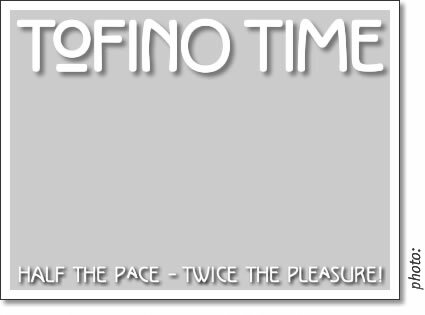 Welcome to onehundredandthirtysecond issue of Tofino Time Magazine in April 2013. The intent of this publication is to serve as a forum in which the town of Tofino, its people and all the activities that make life here special are celebrated and promoted. We hope to be supportive to those in our community who produce & organise all the events that enhance our lives and the time spent here by our visitors. Index for the April 2013 issue of Tofino Time Magazine, a publication for the community of Tofino with articles on Tofino, Ucluelet & Clayoquot Sound.